For a 1970s vintage cruising boat, the Pearson 424 came with better than average storage accommodations. There are huge lockers behind the settee backs in the main cabin, large drawers under the aft cabin berth, and multiple drawers in the galley and forward cabin. Still for extended cruising, and especially living on board, there can not be too much storage (that is not a true statement when it comes to optimal sailing performance - but that is not the subject of this page). Below is some documentation on the storage enhancements I have made to Sarah. Most, if not all, of these improvements were copied from other Pearson 424 owners. Outboard of the fiberglass shower pan is a huge open space. Most 424 owners have taken advantage of this unused space by installing a hatch in the shower pan. I copied those installations on Sarah, using a Bomar access hatch. It is necessary to use a hatch that seals water tight for obvious reasons, but it is not necessary for the hatch to be very strong. The Bomar hatch I chose is probably overkill. Before I can use this space I need to install a shelf, otherwise anything I put in there will slide under the shower and end up in the bilge. In the meantime the hatch will give me access to the area behind the current shower mixer (really a sink faucet with a shower hose attached). I intend to replace this faucet with a real shower mixer control, which should allow more accurate and quick setting of the water temperature. Hopefully it will look a lot less klugey than the current arrangement. One of the areas I have been repeatedly considering for its potential storage space is Main Mast in the cabin. The dinning table surrounds the mast, which means the space above the table is largely unused space. Especially the starboard side of the mast, which is not an effective walk space, and therefore anything hung on the mast would not interfere with movement through the cabin. My plan has been to hang open baskets on the mast as produce and bakery product storage. Until recently I had not been able to find any commercially available system that would work on the mast. Just before my departure from Fort Pierce for the Bahamas, when finding additional storage space became critical, I noticed this storage system at the local Home Depot. It is a wall-mounted storage system, normally for shelving. However these baskets were designed for the same system, but only use one wall-mounted track. This allowed me to hang them on a single mounting track on the side of the mast. The track is mounted with machine screws secured to tapped holes in the mast wall. The baskets slide into slots on the track. To insure the baskets remain in the place, they are held into the track by a piece of shock cord running around the mast. I also used a set of short shock cord pieces to provided a hold-down over the open top of each basket. Heavy items will not be placed in these baskets. I intend to use them primarily for produce (onions, fresh fruit, potatoes) and bakery items (loaves of bread, sandwich rolls, sweet rolls, etc.). I hope the use of these baskets will free up a lot of locker space for boxed and canned goods. Always looking for ways to increase the storage space on Sarah, I've tried several different ways to use the space at the foot of my berth in the aft cabin. There is a deep foot well under the two large drawers on the aft bulkhead. Previously I hung a couple of chart rolls with elastic cord in this space. The well is tall enough that my size 11-1/2 feet didn't hit the chart rolls, even though I'm generally a thrashing sleeper. In early June, 2008 I was in the Container Store (one of my favorite marine supplies stores) and noticed the Elfa under shelf basket system and realized the the shallow basket was no deeper than those chart rolls and would likely fit in the same space. So I purchased a 45cm basket and the shelf mounts then installed the basket under the outboard drawer. The basket is not a perfect fit. It extends out from under the drawer by about 1 inch, but that is small enough that stuff will not easily fall out of the basket. In the picture on the left I've filled this basket with underwear and socks. The basket slides on runners. There is a stop on the basket to keep if from sliding all the way out, off the runners. I'll need to add some elastic cord to keep the basket secured under the drawer when at sea. The picture on the right shows how much of the foot space the basket occupies. So far this has not been a problem for me or my size 11-1/2 feet. Subsequently I added another basket inboard of this one. The second basket holds a full set of sheets and pillow cases. Here you can see the runners on which the baskets are mounted. Sandals for when I'[m visiting other boats and need to be able to remove and put them back on easily. Sandals are also great when taking the dinghy to a beach. Hiking shoes when I'm going to be walking more than a mile or so. So I bought one of the shoe storage systems, cut it down and mounted it on the bulkhead forward of the Navigation Station using snaps, as shown in the picture on the left. This is otherwise unused space below the Navigation Station chair. The pouches are currently secured only by snaps along the top edge, but I will likely put snaps along the buttom edge as well. There are two hatches in Sarah's cabin sole. The aft one provides access to the Walter V-Drive and the engine drive train. The forward hatch provides access to the bilge sump and the aft end of the encapsulated keel, where I have position most of the water pumps. Between this hatch and the main mast step is a large area that is inaccesible. This area is shown in the picture on the left. Some of this space is occupied by the old shower sump, which is no longer in use but could not easily be removed because of the lack of access. I have long wanted to gain access to this area, but that would require cutting hatches into the cabin sole - something I don't have the skill to attempt on my own. On March 2, 2010 Sarah was hauled at Deaton's Yacht Services in Oriental, NC and I used this opportunity to have Deaton's cut the hatches in the cabin sole. This seemed like the quickest and cheapest way to get the job done. Deaton's would just cut out the hatches and I would finish them myself. Someday I will realize there is no such thing as a quick and cheap piece of work on a boat. In the picture on the right I have marked out the hatches I want cut beneath the dinning table, which has been removed. This is to be three side-by-side hatches, each providing access to a portion of the area under the cabin sole. When all three hatches are removed I should have almost un-restricted access to this new storage area. In addition to these hatches I decided to also cut a hatch in the galley area of the cabin sole. There is not a lot of storage space in this area, but the teak veneer has been delaminating for over a year and a hatch seemed like an easy way to remove that delaminated flooring. Once again I was using the totally inappropriate word "easy" in a sentence describing a boat project. I guess I'll never learn this lesson. In this picture I have layed out the dimensions of the galley hatch. Deaton's and I decided to start with the galley hatch. Since I was not going to re-use this delaminated flooring any problems encountered could be overcome with brute force and no loss. The boatwright began cutting out the hatch using a Bosch oscillating cutting tool. After cutting through the flooring and trying to loosen the cut-out we discovered that Pearson had left a surprise for us. I was aware the flooring is made up of two layers of plywood. The top layeer is 1/2' plywood with the Teak and Holly veneer that is the finished surface of the floor. Beneath that is a 3/4" plywood sub-floor that is structural part of the floor. I had assumed that the two layers had been laminated together with glue and secured to the cross members beneath the floor with screws through both layers. Thus, when those screws were removed and the flooring cut through the hatch sections should come free. Not so, Pearson had secured the sub floor to the cross beams with screws, then layed the Teak veneer plywood on top of that and secured it with another set of screws. So the Teak veneer plywood had to be removed before we could gain access to the screws holding the sub floor to the cross-beams. Thankfully we started with the galley hatch for which I didn't need to retain the cut-out material. Knowing the construction of this flooring will hopefully prevent inadverdant destruction of the panel in the table hatches and make that larger job go a little easier (again that word). The picture on the left shows the galley hatch with the Teak veneer plywood removed and the sub floor exposed. This picture shows the screw heads that secured the sub-floor to the cross beams. Finally the hatch opening has been cut and I have access to the space on under this area of the cabin sole. Not really that much space here, but the delaminated Teak veneer has been removed. Now onto the hatches under the dining table. The next day work began on cutting out the hatches under the dining table. Once again the way Pearson secured the two layers of the flooring made the job go more slowly than expected. Also in this case I wanted to retain the cutout panels as the hatch material, so the boatwright was more carefull in removing the bungs and screws that secured the veneer plywood to the subfloor. It took most of the morning to remove the cutout for the port side hatch. Notice that the bungs and screws in the center panel have been removed. By mid-afternoon all three panels had been cut out. The inoperative shower drain sump, which appears to be glassed to the top of keel (thanks, Pearson). When Mike Repass and I were sailing to Portugal in 2005 we had very poor connections to Winlink and SailMail. Finally in Horta we strung some radials off the antenna tuner and the SSB operation improved dramatically. I always wondered why the radials were necessary. Now I think I know. That green mess on the right side of the picture is all that is left of the copper foil signal ground for the SSB. Until I have finished the new hatches, this piece of plywood will suffice as a cover for the openings. After I moved Sarah back to New Bern and the weather warmed a bit, I begain work on the hatches to cover the cabin sole cutouts. In the case of the hatches under the table, the cutout material would become the hatches. In the case of the hatch in the galley I had Deaton's fabricate two pieces of plywood to become the hatch. The priority was to get the hatches under the table completed so I could re-install the table and not have to eat standing up. I could now get access to the shower sump, but I could not remove it. The sump tank appears to have been glassed to the top of the keel. I tried various methods to break it free, including a pry bar. I didn't apply a lot of force as I would rather have the whole tank in place rather than fragments still glassed to the keel. So for now I'm leaving the tank in place. I took off the top and cleaned up the inside. I could use this tank as another locker for parts or tools. This picture shows how I might use this storage area - all of the tool boxes I use on a regular basis and a few of the power tool kits I keep on board. This may not be the ideal use for this space as it can get wet from rain water through the mast and seawater when I remove or replace the knotmeter sending unit. That seawater is likely the culprit that dissolved the SSB grounding foil shown above. In the picture on the left I have laminated the two pieces of plywood for one hatch to gether using waterproof wood adhesive. I also purchased latching lift rings for these hatches from MarinePartDepot.com. The lift rings on the existing hatches are not latching, however they are on the center line of the boat and are not a great threat to come loose during any but a pitch-pole or roll-over. The new hatches are well off the center-line and a severe knock down could launch them across the cabin. After I've installed the latches on the new hatches, I may go back and add them to the existing ones. The cutouts for the hatches under the table were not chosen very well. I now have to add cleat stock to the frames under the cabin sole to support the edges for the new hatches. The first of these cleats was relatively easy as shown on the left. This a 2x3 board of clear pine that I screwed and bolted to the cross member under the sole. If I had started the cutout about 2" aft of where it is now, this cleat would not have been necessary. The things you learn when the job is half over. In the picture on the right I have added longitudinal cleats to support the long edges of the hatches. I used zinc-plated corner braces to attach these cleats. A few days later I added a cleat to the forward edge of each of the outboard hatches. I could not secure these cleats to the existing frames, so I thru-bolted them to the cabin sole. You can see the counter-sunk screw heads in the cabin sole. I'll have to fill those holes with teak plugs. Install the Lift Ring Latches. I think I can get away with one latch on each of the outer hatches and no latch on the center hatch. Plug the screws that secured the laminated plywood to the sub-floor plywood and the machine screws that secure the forward braces for the outboard hatches. After the under table hatches are complete, then I can go on to the hatch in the Galley sole. The installation of the Lift Ring Latches severely tested my wood working skills. I chose the round lift rings so that I could use a Fortstner bit to cut the counter sink for the hardware. If I had gone with a rectangular or square lift ring I would have had to use my Dremel rotary tool as a router and a wood chisel, a much more difficult (for me) approach. The first thing I did was draw a template for the lift ring (MarinePartsDepot.com did not provide one). The legend in the template says , "Edge of Hatch". This should say "Edge of Cleat". That is the template is fixed by the position of the cleat supporting on edge of the hatch, not the edge of the hatch itself. So if the width of the cleat is 3/4", the template should be positioned 3/4" from the edge of the hatch. In practice I added 1/16" to that margin. I used the template to temporarily install one of the latches on a piece of scrap 2x6. I had some problems drilling the holes perpendicular to the wood surface, so I think I'll practice this install on the scrap wood a few more times before cutting into the real hatches. It was a good thing I practiced the installation on waste stock before attempting it on the real hatch material. I discovered it was almost impossible get the 2" Forstner bit started in the material without it walking as much as 1/8". This bit is intended for use in a drill press, something I left behind when I started cruising. I have a portable drill guide that helps me drill holes at fixed angles, and it helps a bit. However, as you can see in the picture on the left I still can't keep the Forstner bit on the mark until it has carved its way into the wood about 1/16". After that the walls of the hole being drilled keep the bit in one place. Unfortunately by that time the hole being drilled is not centered where I intended it to be. After several unsuccessful attempts in the waste stock, I hit on the idea of starting the hole with a hole saw. The hole saw has a guide bit that is in the material by as much as 3/8" before the saw teeth are engaged. This provides sufficient support to keep the hole saw from walking once the teeth bite into the wood. I used a 2" hole saw to provide a groove for the Forstner bit to help it get started without walking. This was successful in the waste stock, so I was ready to start installing the latches in the real hatch material. My first attempt was on the hatch in the Galley. In the picture on the left I have installed the latches in the Galley hatch and put it in place. I still need to do a little more planning of the edges of the hatch to provide a better fit. Right now it binds a bit at the forward end of the hatch. With changes of temperature and humidity I expect the hatch to swell a bit, which might increase the binding sufficiently to jam the hatch. I'm using a block plane on the edges of the hatch to improve the fit. In this picture the hatch has been pulled up, showing the bottom of the latches. The horizontal bar rotates under the cleats that support the forward and aft ends of the hatch. The bars are locked in this position when the left rings are folded down into the body of the fitting. The depth I needed for these latches to secure under the hatch cleats was in excess of the nominal dimensions of the latches. These are the deepest latches I could find, and I was prepared to carve a knotch in the cleats to allow the latch arm to swing into the locking position. I did notice that if I removed the lock nut at the bottom of the threaded rod I could position the arm just low enough to swing under the cleats. The arms have a set screw that is used to lock its position on the threaded rod. I hope that will provide sufficient power to prevent the arm from rotating on the threaded rod. If the set screw is not sufficient to hold the arm in place (so far it's working) I will drill a knotch into the rod to provide a more secure connection between the set screw and the rod. Assuming the arms on the latches continue to work without modification, I still have several tasks before the galley hatch is complete. Cover the heads of the screws I used to clamp the two pieces of plywood together for gluing. Paint or varnish the upper surface of the hatch. Finally the Galley hatch is finished. I decided to varnish rather than paint the top of the hatch. The Mahogany veneer is not that great a surface, but I had a small can of varnish in my parts bins so why buy paint? I put down 5 coats, then taped off the center part put down 2 coats there with a non-skid compound mixed. I added one final coat of the varnish to everthing. Then I re-installed the latches and put the hatch back in place. The reason the non-skid area has an irregular shape is to identify the forward end. I believe this project is finally over. Having practiced installing the latches several times on scrap stock and then installing two latches on the hatch in the Galley, repeating the process on the two outboard hatches under the table was very straightforward. The only difference is with these hatches I installed the latches well off either of the edges. I decided to latch to the cross beam about 5" aft of the forward edge of these hatches. I thought this would make it much easier to lift and replace the hatch with a single lift ring. In the picture on the left I used the 2" hole saw to provide a groove for the Forstner bit to minimize the amount of walk by that large bit. On the right the port table hatch is in place and latched. The only remaining task for these hatches is to fill the counter sink holes with teak bungs. I think I will be doing a lot of experimentation with the stuff that actually gets stored under the cabin sole. I've pretty much decided it won't be power tools as shown in the picture above. 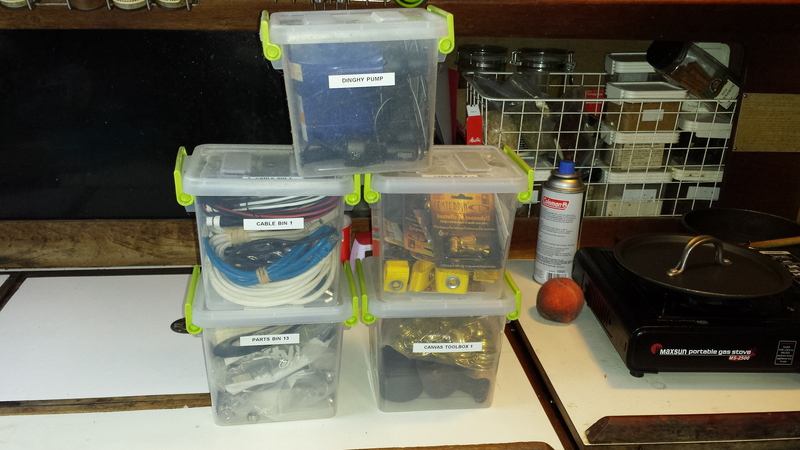 For now I will store my fastener collection (all stainless steel) and a few toolboxes. The collection shown in the picture on the left pretty much filled up two large lockers before, and there is still room for more stuff. Since I am stuck with the old shower sump in place, I was pleased to discover that some of my plastic parts bins/toolboxes are a near perfect fit in the sump. This hatch has nothing to do with storage, only access below the cabin sole. While I had Sarah at Deaton's Yacht Services for the V-Drive replacement I had them cut a hatch between the large one over the V-Drive and engine box. This hatch gives complete access to jack-shaft between the transmission and V-Drive and the prop shaft from the V-Drive to the shaft log. In particular it gives access to the PSS shaft seal, something that was very difficult before. This hatch also gives access to a number of water hoses that very difficult to get to before. I used the same lifting latch as I used on the other hatches. I forgot to add 1/16"-1/8" margin when positioning this latch with the template I created for the earlier hatches. Without that margin the latch piece is a little too close to the cleat stock and the knuckle of the latch (the vertical part) presses against the cleat. This makes the operation of the latch a little stiff. That's not really a bad thing, but it would have been better if I had positioned the latch a little further aft. One of the most wasted spaces in the main cabin is that under the forward companionway ladder. This space is open, especially to allow anything stored there to slide into the galley when the boat is on starboard tack. Mike Repass picked up several small Coca Cola cases while we were in Horta and they fit perfectly under the steps. I secured them in place with elastic cord and stored some safety items (harness, lights, etc.) in those cola cases. Unfortunately I couldn't store anything really bulky or heavy and finally the cola cases deteriorated and had to be disposed of. When I finished up the cabin sole hatches described above, I still had that sheet of 1/2" plywood I used to cover the cutout under the dining table. So I cut a piece to match the space between the ladder and the bulkhead. This is now a door for the space under the ladder. I used a pair of the break-apart hinges I purchased for the engine box cover, but never used for that purpose. These should provide plenty of strength to hold the storage boxes I've placed under the ladder. The hinges are secured to the bulkhead with self-taping screws, but are through-bolted to the plywood door. Although the door will not swing fully open, parallel to the bulkhead I can still get full access to this space by lifting the door off the hinges. The plastic boxes I've placed behind the ladder are too large to slide between the steps. In the future I may want to place smaller tool boxes in this area that might fit between the steps. 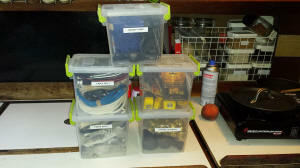 In that case I will likely run some strong elastic cord down the back edges of the steps to keep those items in place. To secure the plywood door shut I installed a barrel bolt that slides down into a bulkhead keeper in the cabin sole. This along with the through-bolted hinges in the door should be strong enough to hold back the storage boxes I plan to keep in this space. The barrel bolt ((Perko 0947DP1 CHR) has a friction plate to keep the slide from moving. That, and gravity, should keep it in place when Sarah is rolling or pitching. The only problem might be at the top of the door, which is not secured. I don't plan to stack anything heavy more than half the height of the door, so I don't think this will be a problem. If it does become a problem I will install a brace from the bulkhead to the ladder tube and use the brace to secure the top of the door. Now all I have to do is cover the edges of the plywood and paint it. When I replaced the original Kenyon stove with Force 10 in 2003 I lost the storage space for the oven cover. The cover used to slide into the space outboard of the oven, but the Force 10 is deeper than the Kenyon and the cover no longer fit in that space. I did find a natural place to store the cover - behind the forward companionway ladder, hooked on the back of the top step. The only problem with this space is that the cover was not secure and when the boat rolled or heeled the cover would slide out and crash onto the cabin sole. So this storage place was not usable under way until I could figure out a way to secure the cover. After installing the door for the space under the ladder I realized how I could secure the cover - with another of those barrel bolts. I installed a barrel bolt on the bulkhead trim just above where the cover rest when stored under the ladder. Then I drilled a 3/8" hole into the edge of the cover. The bolt slides down into the hole and the cover can't move. This is one of those very expensive Perko barrel bolts, but they are the only ones I can find with a keeper for the bolt. The plastic insert under the body of the barrel bolt provides enough friction to keep the bolt in place. I do not have to worry about this bolt coming loose when the boat is underway. One additional advantage of this storage space for the oven cover is that it acts as a kick plate for the companionway protecting the bulkhead from hard shoes. Now I need to finally finish painting the bulkhead. In the processs of fixing a leak in the water tank under the port settee bench, I had to make a cutout in the bulkhead just aft of the settee. This provided access to the open space between the water tank and the bulkhead. This space is about 6" wide. I found some small containers at Walmart that just fit in this space. There is enough room to stack these containers. This space was discovered years ago by several other P424 owners, but only the need for access to the water tank finally forced me to make this space available on Sarah. I still have to put a cover on this openning. Initially I will probably just cover it with a piece of HDPE, which means this space will not be used for anything I need frequent access to. Containers Stored in This Locker The five containers shown on the left easily fit within this storage space.